Ploß® furniture made out of premium teak uses only the heartwood from the middle of the trunk which is on average 30 years old. Specialised workshops polish the wood surface repeatedly until it is pleasantly smooth to the touch. In addition, this process seals the pores in the wood, minimising its susceptibility to cracking in different weather conditions. Nevertheless, wood is a living material that can react to dry and hot conditions by forming cracks. This is normal and does not reduce its durability or stability. The fittings and screws used in Ploß®’s premium teak furniture are always made of brass or stainless steel. Our wide product range offers a multitude of top quality products. We take special care that the wood used is of high quality and processed distinctively. This is why our furniture is made of premium teak wood. The teak tree is a species that grows particularly in South and South-East Asia. From there, the wood is exported all over the world. The timber of the teak tree is a very important export for the Asian region, because it is considered extremely valuable throughout the world and is in great demand as a result. The great durability of the wood means that our teak garden furniture is of high quality and requires very little care and maintenance. Thanks to its outstanding properties, the wood protects itself against wind and wet weather, and insects cannot harm it easily either. But in order to derive the greatest pleasure from our products for as long as possible, we recommend treating the furniture with natural oils. Teak trees can grow to heights of up to 40 metres. A large population of these trees is found particularly in Thailand, Indonesia and Myanmar, meaning that they are very important for the economy and trade of these countries. Since the crowns grow to extremely great heights, the usable part of the trunk is very large in a teak tree. The grain of the wood is very beautiful and therefore perfectly suited for our individual premium teak furniture. Its intense, dark brown colour gives the wood of the teak tree a particularly warm feel and this is one of the reasons it is known and loved all over the world. Since the tree grows and flourishes in tropical regions, its wood is resilient and robust. The large numbers of insects that are widespread in Asian countries mean that the wood has developed a high resistance to these animals. For this reason, the wood is very durable and does not show any signs of wear and tear even after prolonged use. 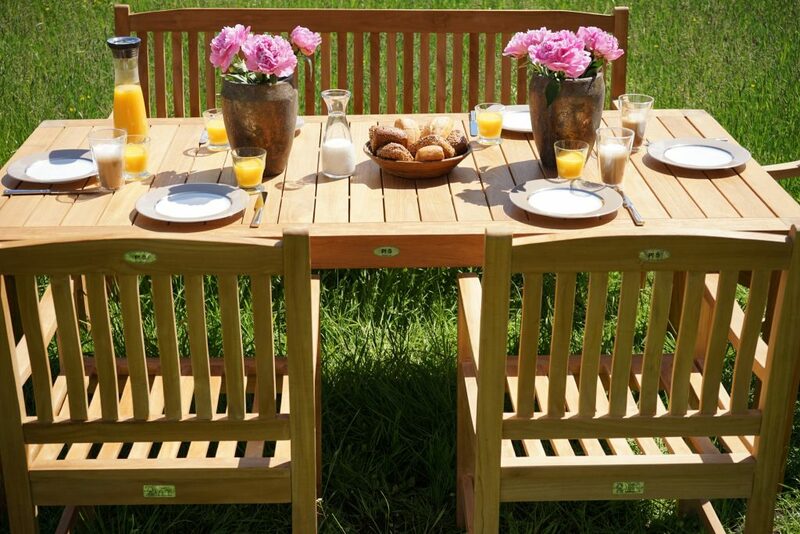 As a result, you will be enjoying our garden furniture made of premium teak for many years to come. Premium teak also has the property of being acid-resistant. The sturdy wood of the teak tree can withstand the wind and the weather. Thanks to this quality, you do not need to worry about leaving your furniture standing outside in the garden. 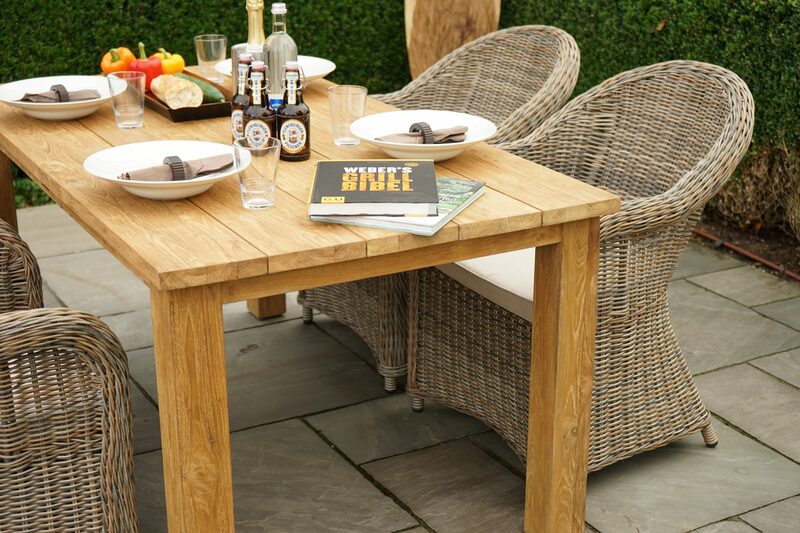 Your garden furniture made of premium teak is weatherproof and can withstand any storm. The sustainable management of teak forests also deserves to be mentioned: Originally, these trees were only found in Asia, but due to the quality and growing popularity of the wood, they soon started being cultivated in other regions too. Today, the plant is also found in many parts of Africa and Latin America. The teak tree population is extremely large and continues to spread. 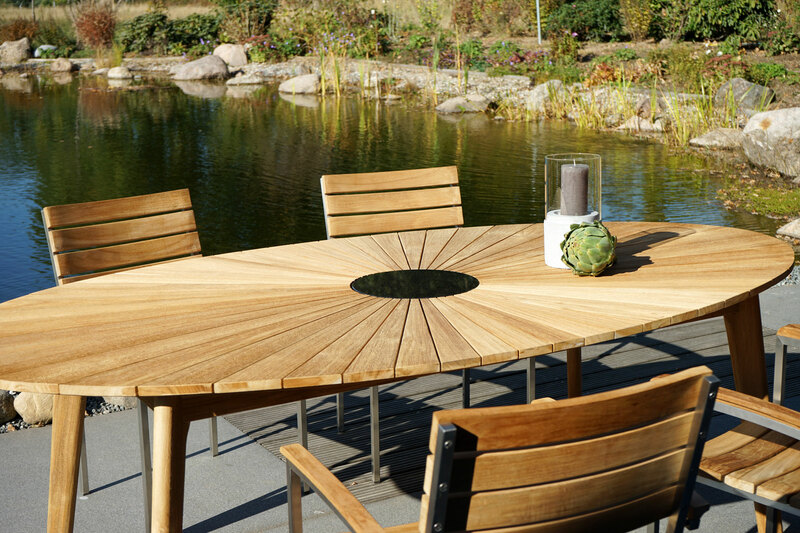 Premium teak is therefore a resource with a promising future – also for your garden. For all these different reasons, we believe in using the wood of the teak tree for our high-quality products. This is why we can guarantee the high quality and durability of our wooden furniture. In our catalogue, you will find a wide and varied selection of garden furniture made of premium teak. This is bound to include something to your own personal taste. You will be surprised by the abundance of different shapes and colours. 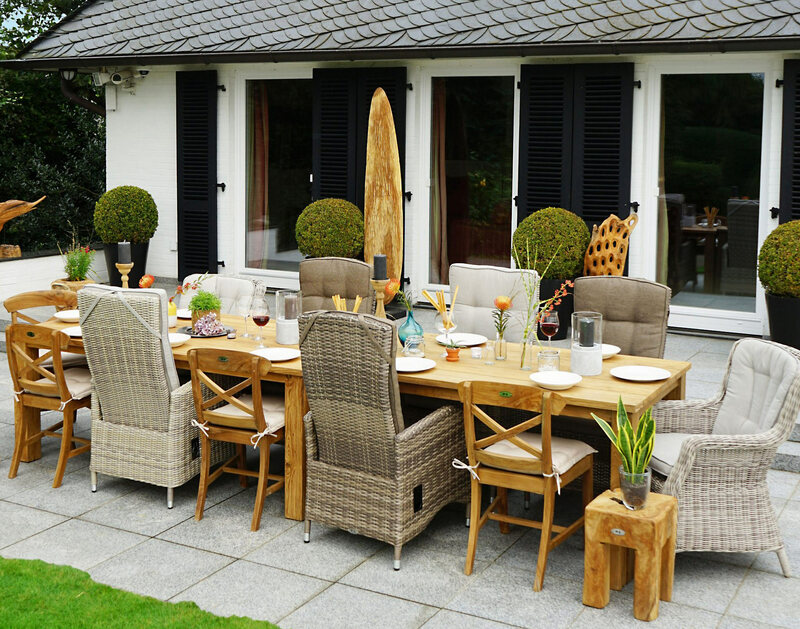 No matter whether you need a new garden table or some new garden chairs: choose the appropriate furniture for your garden and delight in the harmonious overall impression that will envelop you as you step out into your garden. 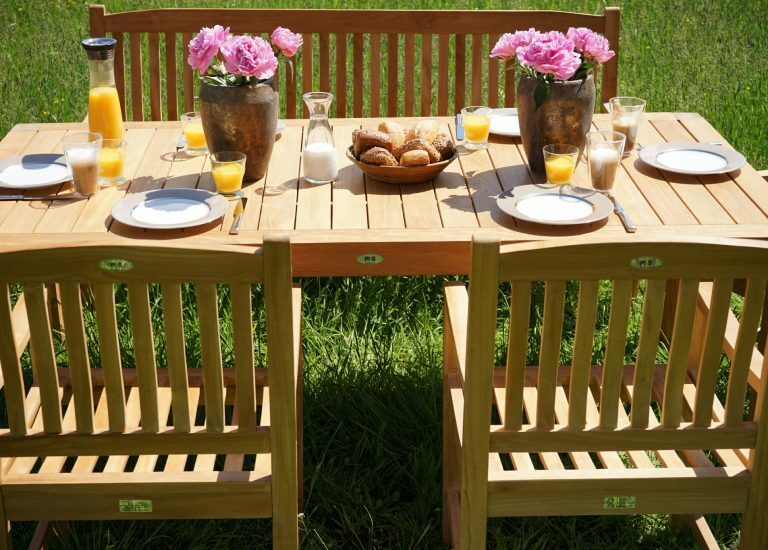 Our range is sure to include just the right items of furniture to complement your garden perfectly. Look forward to hours of rest and recuperation!